The administration’s own data shows that despite an announced intake of 723 seats, only 625 M.Phil./PhD and Direct PhD seats were offered in 2018-19. In a shocking revelation, the Jawaharlal Nehru University Teachers Association (JNUTA) has alleged that the administration led by Vice Chancellor M Jagdesh Kumar, during the admission process of 2018-19 for M.Phil and PhD, not only denied admission to Scheduled Castes (SC), Scheduled Tribes (ST) and Other Backward Class (OBC) students despite their qualification and availability of seats, but also transferred their seats to unreserved categories. The association said that the JNU administration cannot refute denial of admissions to SC/ST/OBC students as the data regarding this was furnished by the administration itself in Delhi High Court. The data suggest that the administration could have done so only by implementing the criteria of 100% viva marks. The Delhi High Court in its judgment struck down the criteria of 100% marks for viva voce or interview and said that it led to "national waste of resources." The JNUTA alleged that as per claims of the administration, against the total intake of 723, as many as 625 seats were offered for admission, leaving a deficit of 98 seats. But a look at another set of data reveals that 124 seats for reserved categories were left vacant deliberately. So, the claims regarding vacancy of 98 does not hold ground. It said, "Once again, all the seats that are vacant are reserved seats. These actually amount to much more than 98, according to the reservation targets announced category-wise. At the point admissions were announced, 352 were designated as reserved seats, but of these only 201 were offered. This leaves a deficit of 124 reserved seats, yet JNU announces a shortfall from intake of only 98. The JNU administration must explain how this figure of 625 is obtainable from its data." The data further shows that the vacancies were maintained by not offering the seats to students despite their eligibility. It said that total intake for SCs in the university remained at 107, but only 62 seats were offered for admission. This was done despite the fact that 184 students had qualified after the interview Interestingly, 23 seats were transferred to unreserved categories. Similarly, against the sanctioned intake of 198, only 125 seats were offered for admission to OBC students. The number of eligible students after viva or interview remained 442, but the administration chose to transfer 59 seats to the unreserved categories. 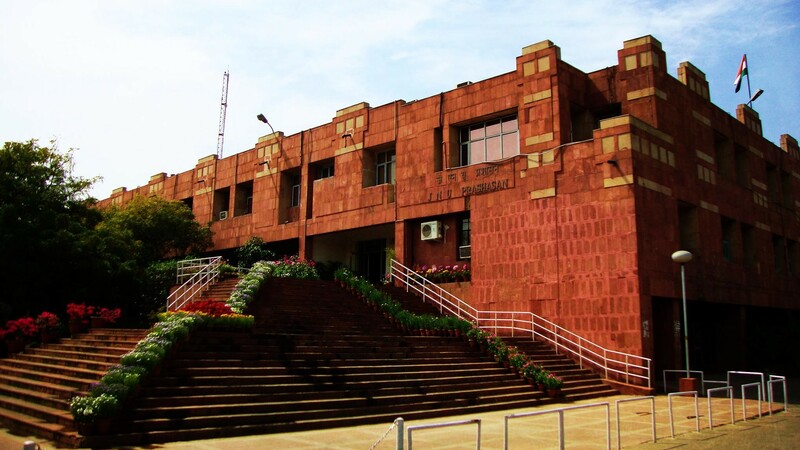 The association, in a statement, said, "despite twice the number of SC candidates who had qualified being available, thrice the number of STs, and four times the number of OBCs, the JNU administration chose to leave the seats vacant." The teacher’s association maintains that the figure of 98 vacancies could be justified only when the seats were transferred to the unreserved categories. They said that even the centres were kept in dark as they were given the list of admitted candidates without any specification about the quota. 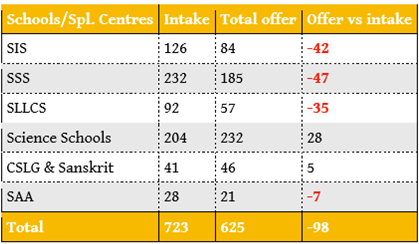 Interestingly, while the all the centres saw a reduction in the number of seats, a few schools offered more seats than available. For example, the sciences schools offered 73 extra seats against the strength of 100 students. The members said, "Contrary to its announced admission policy that did not allow offers to exceed intake, some programmes were mysteriously given extra seats to offer. This generosity was not extended to all centres, and in all instances, the bulk of the seats added were unreserved (UR) seats." Terming this as a “murder of social justice”, the JNUTA said the "The Centres and Schools of JNU have in no way been party to this murder of social justice, as for the first time in JNU’s history, most (if not all) Centres were not shown the decoded sheets and asked to mark the cut-offs. Centres were only sent the lists of candidates admitted, without any specification of the quota."